What happens after Tanglewood? 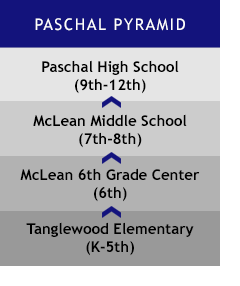 After 5th grade, students who are zoned to Tanglewood move up through the “Paschal Pyramid.” Continue reading to see why we are so proud to be a part of this pyramid. Amazing Advanced Academics — 9 High School Level Courses including Latin, French, Spanish, English, Aquatic Science, Algebra, Geometry, Career Connections and Keyboarding. Paschal had 618 students take 1535 AP Exams in May 2009 and currently has 176 AP scholars. The most in Fort Worth! Paschal has over 30 college-level courses making it the Top Advanced Placement (AP) Program in Fort Worth. Paschal leads FWISD in SAT averages. Paschal leads Tarrant County in National Merit and Minority Scholars with 46 awards this year. Paschal has 11 National Merit Semifinalists (out of 14 in the entire FWISD). This is more than any private school in Fort Worth and more than any high school in the Dallas or Arlington ISDs. Paschal leads FWISD in number of National Merit Honorees. Paschal’s seniors led this area in number and dollar amounts of scholarships with over $32 million in scholarship offers. Students go on to over 200 colleges, including Yale, University of Pennsylvania, M.I.T., Stanford, Duke, Vanderbilt, and many more. Paschal leads FWISD in RadioShack Scholars with 700 Paschal students with a GPA of 4.0 or higher in May of 2009. Paschal leads FWISD in number of Distinguished Achievement Graduates. Paschal students have led the district for many years in the American Mathematics Competitions. The Paschal Computer Programming team traveled to and won numerous state wide competitions. Paschal choral, orchestral, and symphonic band students have recently won All-State recognitions. The choir was invited to perform in Austria the summer of 2009. The Vagabonds (drama) present at least 4 plays each year – a Shakespeare play, a musical, and one-act plays both in competition and student-directed. Students have a variety of sports to compete in: Baseball, Basketball (Boys and Girls), Cross Country, Cheerleading, Football, Golf, Power Lifting, Purple Elite, Soccer (Boys and Girls), Softball, Swimming, Tennis, Volleyball, and Wrestling. Contact Summer Jones for more information about the Paschal Pyramid.